Newfoundland has been hit by a number of powerful storms in the past. Modern day storms have often packed a punch - destroying property, infrastructure and occasionally claiming a life. In 1775 an Atlantic Hurricane struck Newfoundland killing an estimated 4,000 British sailors. We have been relatively fortunate when it comes to hurricanes. Although these storms often end up crossing our province, or just offshore, they usually have lost most of their strength before they arrive. Depending on the time of arrival, other weather systems and sea states, a smaller storm can be as devastating as a larger one. Hurricane Igor caused widespread flooding, destroyed roads, wharf's, breakwaters and claimed at least one life when it's fury was unleashed in 2010. The Insurance Bureau of Canada pegged the cost of the damage done by the 140 km/h winds and 200 mm of rain at over $200 million. Igor was a Tropical Storm with winds that gusted to 140 km/h which according to the Saffir-Simpson scale is equivalent to a Category 1 Hurricane. With that in mind, I am trying to imagine the catastrophic damage that Hurricane Patricia is going to leave in it's wake when it hits Mexico today. Patricia is the strongest hurricane to ever develop in the Western Hemisphere putting killer storms like Katrina, Andrew and Camille to shame. 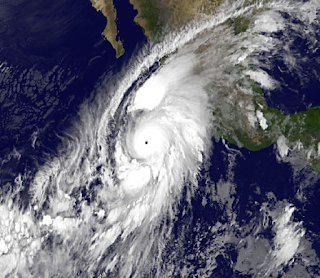 The Category 5 storm is packing winds near 325 km/h and is bearing down on the densely populated Puerto Vallarta region. Patricia has the potential to cause massive death and destruction forcing hundreds of thousands of people to flee. Once again, Mother Nature is reminding us who is boss.